While stampers like nothing more to get busy with their stamps, there are times when a quick alternative is useful. This might be for occasions when time is short, the perfect stamps are not to hand or simply as an opportunity to experiment with new techniques. Decorative papers, such as those used as backgrounds in scrapbooking and card making projects, are perfect for use in many other types of projects. These papers are often created by well-known designers and can introduce the 'wow' factor to even the most mundane project! Decorative papers are available in a wide range of styles, from contemporary to classic. And the best thing about using decorative paper is that by simply changing the theme of the paper, you can create boxes and other items for a range of different occasions. Use digital papers - there are many low-cost and free digital papers you can print to use to make these projects. Use decorative papers to make these simple gift boxes. These can be customized further by the addition of some rubber stamped embellishments. These gift boxes are also great for holding keepsakes or items of jewelry. You can use virtually any gift box template as a base and cut it from decorative paper to create pretty gift bags and boxes. Tip: Make a few in different sizes using complementary papers and stack them on a dressing table or desk to use as an organizer. Baskets make an interesting alternative to gift bags. This basket is made from a single square sheet of paper and can be embellished and adorned in many ways. Tip: Make a rubber stamped gift card using coordinating colors and hang it on the side of the basket. Use a punch or a template to produce quick and effective tags. Simply cut a tag shape from a piece of decorative paper. Tags are versatile and as well as being handy for attaching to gifts, tags can be incorporated into handmade cards, scrapbooks, and other projects. Tip: To make a quick yet effective greeting card, take a tag and envelope from odds and ends of left over decorative papers. Add these to a handmade greeting card that has been stamped using a complementary rubber stamp design. Use the back of the tag to write a special message. Give paper chains a sophisticated makeover! Use decorative papers interspersed with paper that has been stamped with complementary rubber stamps to create contemporary paper chain decorations. Tip: Make paper chains to match table decorations and use these to add an extra decorative touch to a special dinner or party. Decorative paper can also be used to cover an old food box or container (the box in the image above started life as a cheese triangle box). 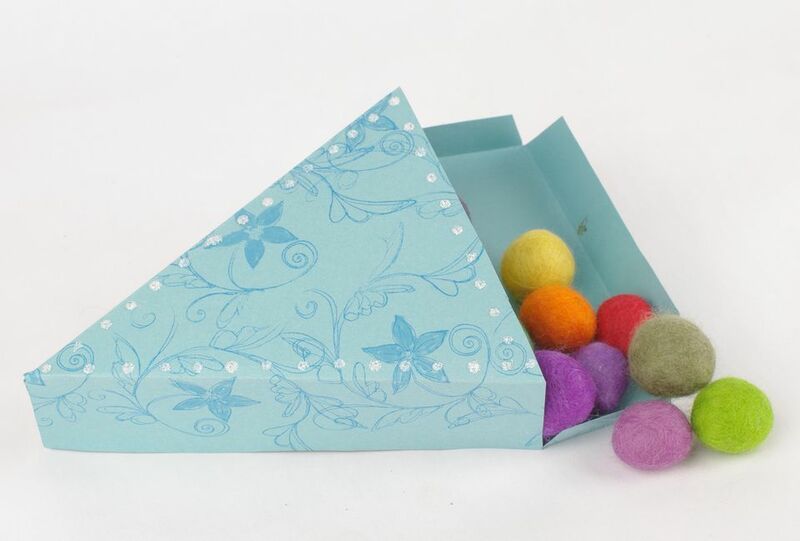 When finished you have a cute little box which could be used as a gift box or storage box. Simply cut this dome box template from decorative paper for great results. This really could not be easier and is a great way to produce a stunning looking gift box with the minimum of effort! Tip: Over stamp the paper with clear embossing ink and emboss this to give an added dimension to the paper. The shaping of the box will show off the embossing to great effect.